The Dorset Horn, which was developed to its present form in the mid 1800s, and is known for its all round qualities as a meat and wool producer. Its chief distinction is its horns – large and curled – in both rams and ewes. 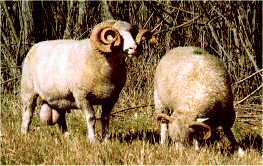 Ewes with horns of this size and type are unique to the Dorset breed among modern domestic sheep, while the rams’ horns are even larger and tightly curled in “regimental mascot” style. The Dorset Horn is a big sheep, hardy and very active. It boasts capacious stomach and is an excellent “doer”; a ewe in good condition tends always to look as though she is in lamb and even the rams often look a little “preggie”. The fleece is of medium length, fine and very white, and the face and legs, clear of wool, are also noticeably white and show another of the Dorset Horn’s distinguishing features – a pink nose and light coloured hooves. This pink and white look is particularly marked in lambs where it appears to be intensified; a young Dorset has hoofs of mother-of-pearl and a nose like a fresh raspberry. The breed’s other great distinction is the forwardness of the ewes. 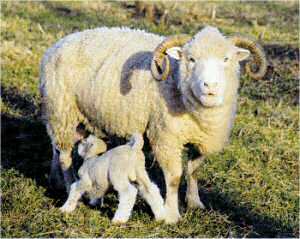 Dorset ewes can breed twice in one year although three lambings in two years is more usual. The lambing rate is good and they are excellent mothers with abundant milk. The Dorset’s characteristics, the horns and the breeding rate, were bequeathed to it by a dominant ancestor – the now extremely rare Portland Sheep, found originally on and near Portland Island, very close to Dorchester. The Portland Sheep was first recorded in the sixteenth century and its origin is obscure, but it was spectacularly horned, and noteworthy because of its ability to lamb all year round – with up to four births in two years. Dorset Horn sheep were imported into New Zealand in 1897 and several times in subsequent years, but did not prove very popular. A further importation in 1937 marked a period of breed increase, but numbers remained low. By the early 1990s they had dwindled less than five hundred in New Zealand and were also rare in their homeland, Great Britain. Their horns are no longer acceptable at a commercial level. They cause carcase damage in these days of trucking sheep rather than driving them, and the shearers don’t like them either. They are, however, an excellent breed on a smallholding, being extremely quiet and easily handled, as well as producing excellent meat and saleable fleeces. It is pleasing to be able to report that numbers have increased slowly over the past few years.